Éric Alliez, Maurizio Lazzarato, Amanda Beech, Robin Mackay, Christine Wertheim, Brian Evenson, Reza Negarestani, Joshua Johnson, Patricia Reed. 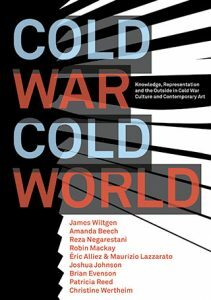 The term ‘Cold World’ refers to that which is irreducible to knowledge. But it also refers to what is yet to be known, and ultimately prompts us to think about how the intelligibility of alienation as a condition of knowledge and political action need not stand in contradiction to the ability to take seriously an orientation toward the future. …Art is the essential spirit of a Cold World entity, since in figuring the space in which intelligence is exhausted, it can evidence the limit capacity of human knowledge. And yet through this rupture that is both internal to and set against knowledge, art symbolizes an idea —namely, the idea that something else can exist, but, crucially, that this thing cannot have any particular qualities, for this future without design must be equally principle- and norm- free.